Summary: This is a wonderful walk. The start, as is typical of many of my walks is demanding from the very start with a steep ascent from Legburthwaite to the high ground via Sticks Pass. 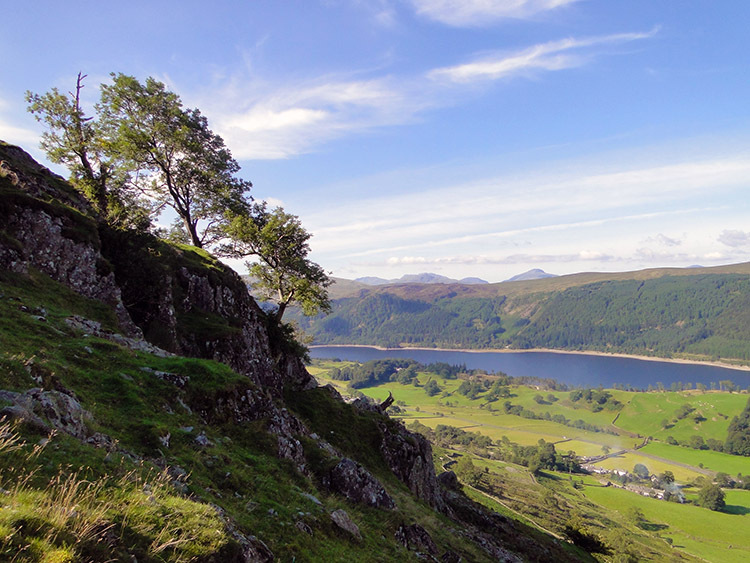 With most of the really hard work done the walk is then to be thoroughly enjoyed with lovely walking to the three Wainwright Dodd's (Stybarrow, Watsons and Great) and then Clough Head which provides the most fabulous views of the Skiddaw and Blencathra ranges. After enjoying the views the descent is begun first to Threkeld Knotts and then to St John's in the Vale before a final low walk back to Legburthwaite. 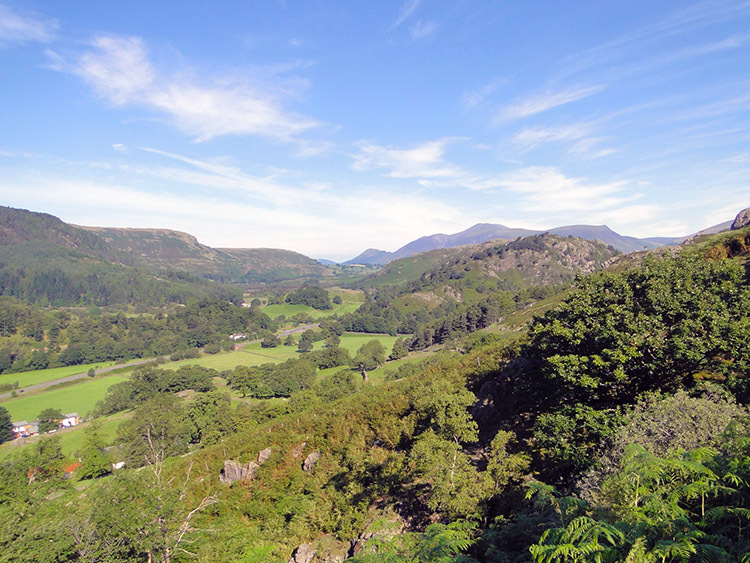 We had a discussion on the last evening of our 2nd Annual Lake District Walking Adventure on which was each of our favourite walks of the four we did over the long walking weekend. It was tough deciding between four walks, all of which had particular attributes but when it came down to the final vote we couldn't decide between the first walk to the Langdale Pikes and this thrilling adventure. So I think we left it at a score draw. 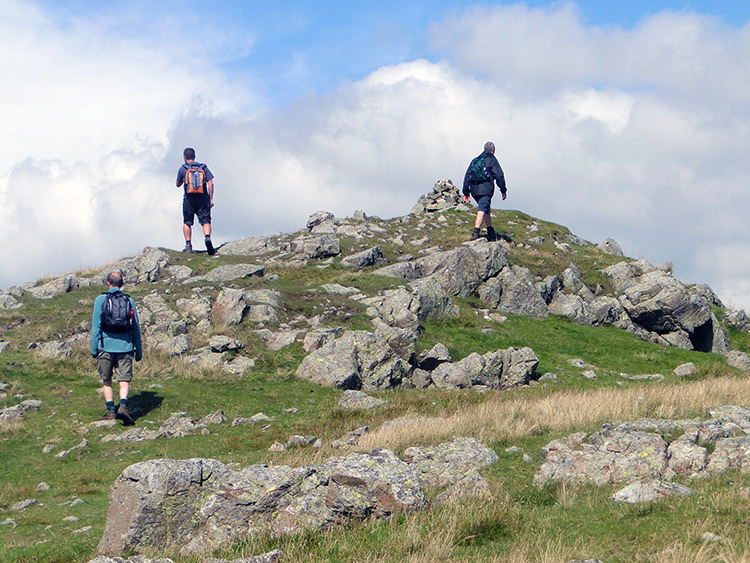 This adventure started, as is often the case with our walks, with a severe ascent to the high fells from a low Legburthwaite via Sticks Pass which involves an ascent of almost 600 metres in 2.5 kilometres with the first 250 metres of ascent in the first 700 metres. I recall Steve, Dave and I doing it once before on our first Helvellyn and Striding Edge walk, a walk in which Dave was not too enamoured with the stiff start. Some things don't change but he was sufficiently resolute to drive himself up the steep fell side without complaint and in parts he led me to the higher ground. Steve and Chris were slightly ahead but I was not going to rush up when I could stop to take breathers and capture sublime views over Thirlmere and Steel Fell to the emergence of the highest of all Lakeland's mountains beyond. I also stopped on the climb alongside Dave to watch the antics of the farmers at Stybeck Farm near to our starting point. They were trying to roust the stock indoors for milking but the cows were not too inclined to do so. As we climbed further the noise eased and after a kilometer we had sufficient height and distance that the noise of the farmers and the traffic on the A591 was gone. Steady ascents and breathers followed with reflections on the changing views constant until we reached the breast of Sticks Pass, the last half a kilometer being a steady manageable climb to the intersection of paths where we sat and rested for a while. Sticks Pass has the distinction of being the highest pass in the Lake District which is crossed by a path of common use and we were sat right at the top of the pass taking a drinks break on the small pile of stones marking the crossroad of paths. It was a beautiful Monday morning and I chilled out while resting on the highest point of Sticks Pass with my friends rather than a typical Monday working in an office or being stressed travelling on one of England's horrendous motorways. It was bliss and I looked round to the high points in view. To my far right was Raise a peak of which I had fond memories of looking out from its summit over to Ullswater some years ago. Keeping right beyond Raise would lead us to Helvellyn and Striding Edge as Steve, Dave and I did last time but this time our aim was left to the Dodd's with Stybarrow Dodd being the first. After the trials of the climb over Sticks Pass the walk was pleasant with a gentle ascent to a slight peak appropriately named Pile of Stones for that is exactly what was on the peak and then another gentle walk on a pleasant grass surface to Stybarrow Dodd which was featureless at the summit, not exciting at all. From Stybarrow Dodd we then strolled, and strolled is an appropriate term to Watsons Dodd and then again to Great Dodd. It was easy walking and although unexciting it was pleasurable. A reflection: There is a great similarity to the walking on the Dodd's to walking on the Howgill Fells as they have similar appearance on the tops by being grassed and gently undulating. If I was dropped on either the Dodd's or the Howgills in mist and wandered on the tops then I would have difficulty telling them apart. The difference is in what lies beneath and in particular what faces walkers who try a west face descent of the Dodd's Now that is treacherous but more on that soon. 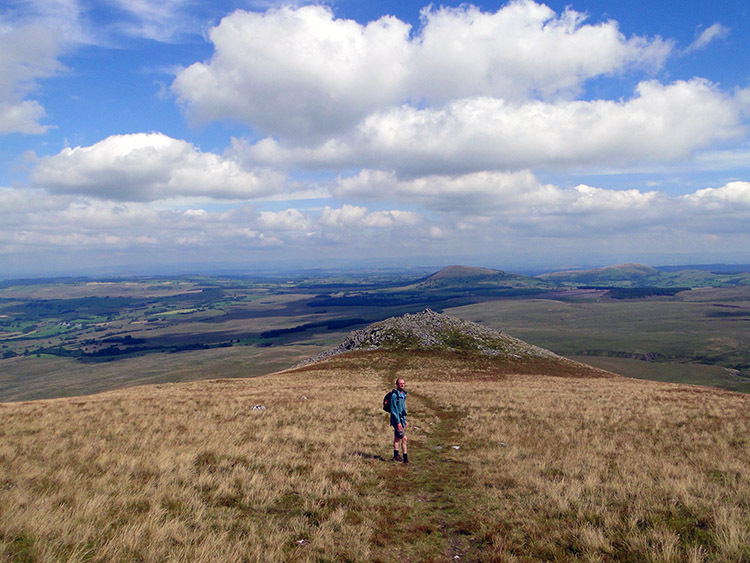 For now we had completed three Dodd's and Clough Head was waiting; but not before the little matter of descending from Great Dodd to the only real outcrop in the vicinity, the curious tor of Calfhow Pike, a small spike of rock in a land of rolling grass slopes. While on Calfhow Pike our eyes were drawn to Clough Head, not because it was our next target and the fourth and final Wainwright Fell of the day but because we saw one paraglider rising on the thermals and then another, and then more. They were growing in number all the time and it was a serene sight to watch as we made our way up the slope. 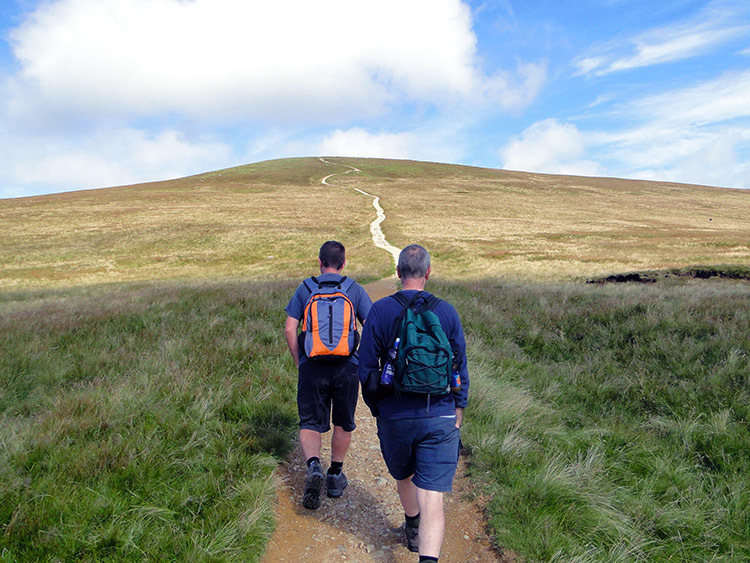 The climb to Clough Head was consistent, a steady gradient of 80 metres ascent in 300 metres distance on a clear trodden grass path and a climb that we took at varying pace. Chris led the way wanting to observe the paragliders at close quarters. Steve was next with me right behind and I was hoping so much that the paragliders would still be there when we reached the top so I kept walking - no pictures unless an opportunity arose and only once did I stop near to the summit to capture the photograph above of Steve with eyes fixed walking towards a paraglider landing on Clough Head. 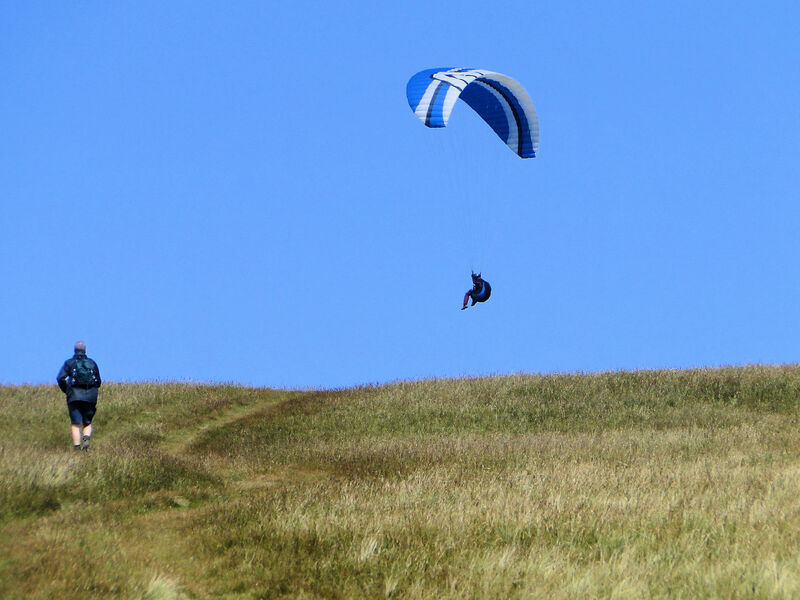 Dave was not too far behind also making his way to closer views of the paragliding aeronautics show on Clough Head. As Chris reached the brow of the mountain I noticed him run and wondered why, surely not a sprint to the summit? After Chris ran Steve stopped and began filming. Surely not to catch Chris's sprint to the summit. Soon after I reached Steve and all was revealed. Chris was stood in conversation with the paraglider who had come to ground. We walked on to join them and only then was the drama of Chris's sprint explained. As the paraglider had landed he had lost his feet and was been dragged by the wind in his still open canopy across the fell. Chris had run to the canopy and collapsed it. "Knocking the wind out of his sails" was how Chris put it. The paraglider was grateful and a good chat was had before he went off to the west edge of Clough Head. Whether or not he took to the air again we don't know. For us we walked a short distance to the summit cairn where the boys made their traditional walk pose, a ritual Dave and Steve started in the 1990's. It is an awesome sight; see the photograph above right. 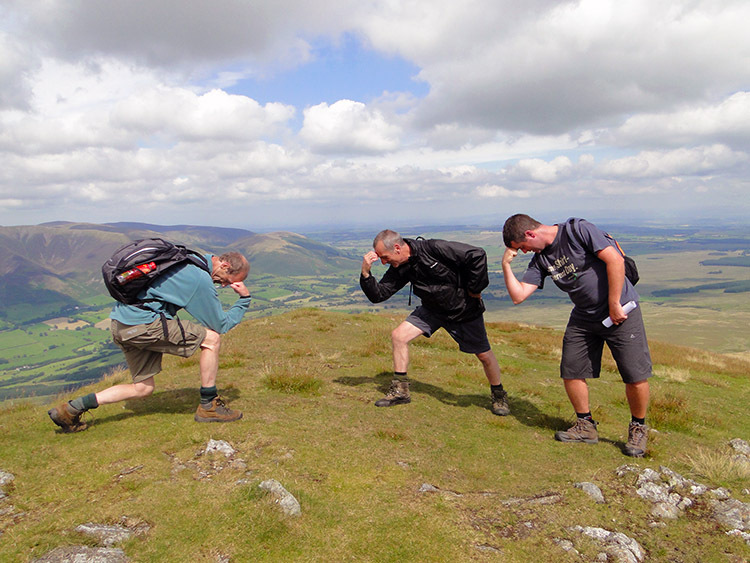 The pose represents a triumph, invariably taken at the high point of a days walk, be that in height or spiritual. Before we leave Clough Head I will add the views due north to Blencathra are the best, a simply stunning unbroken view of the Saddleback's southern aspect. 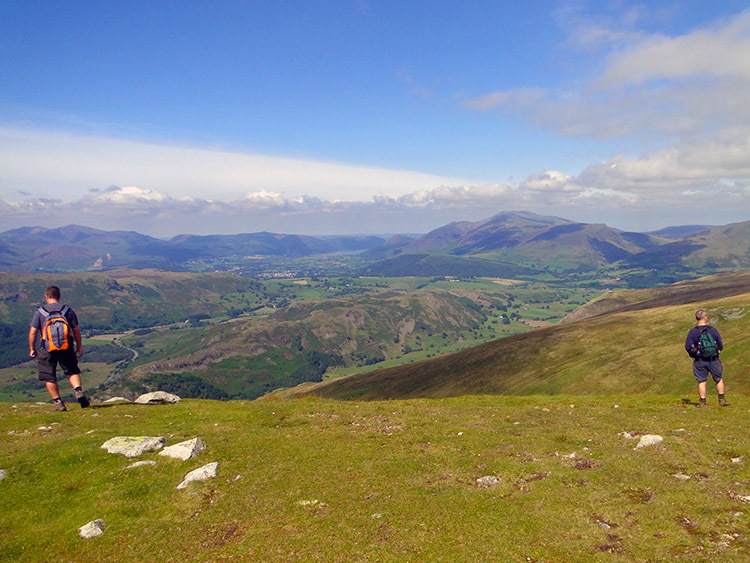 Skiddaw to the north west is also spectacular from Clough Head and according to Wainwright "A nice combination of mountain and valley scenery. This is an excellent viewpoint, the skyline between south and west being especially striking". There are also clear views east to Penrith and the Pennines beyond. Referring back to my earlier text note I made direct comparisons to the walking on top of the Dodd's to the top of the Howgill Fells. 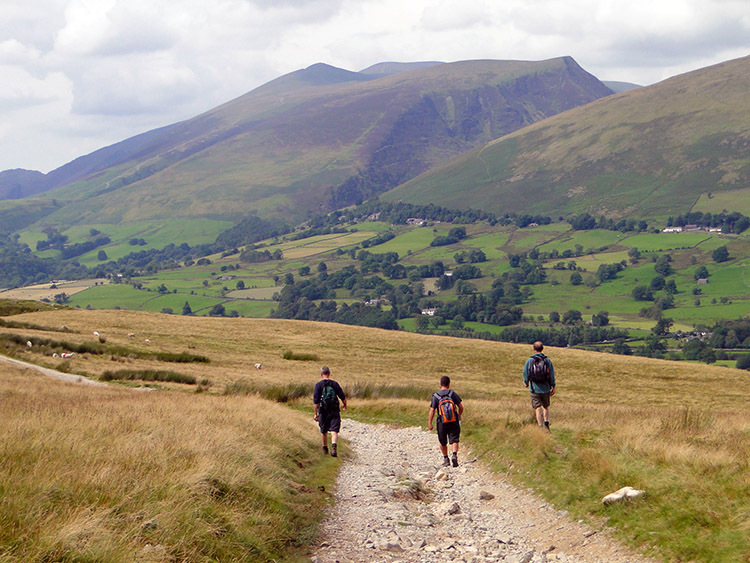 The comparisons end there for the Howgill Fells have easy and safe ascents and descents from all directions. The Dodd's do not. 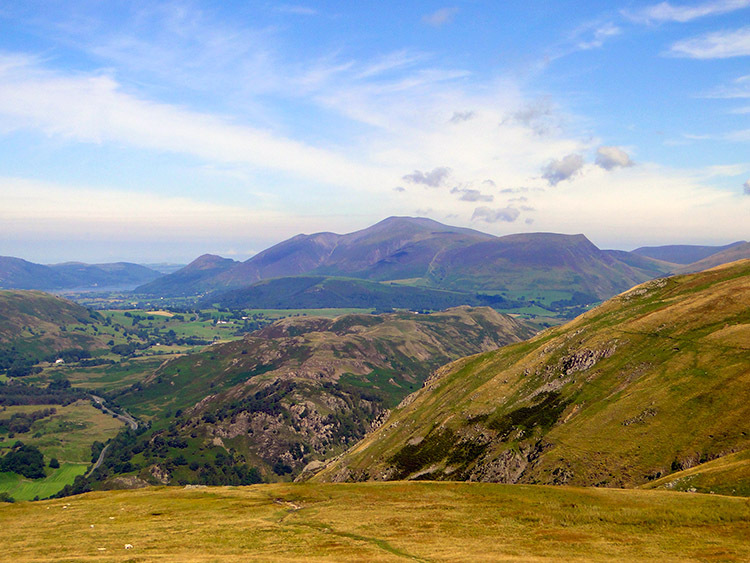 The west facing aspects of Clough Head and Watson's Dodd are a mess of steep gullies, sheer rock faces and cliffs. I had planned a route down the western edge of Clough Head but from the top we struggled to find it. I knew there was a way down but Steve asserted "It may show it but there is no path down there" And that was with a GPS hand held confirmation. We did not go down by the west face so after the weekend I returned home to check my mapping. It was then I found the following paragraph from Wainwright's guide to Clough Head "Fisher's Wife Rake is difficult to locate from above and in any case is too steep to provide a comfortable way down. 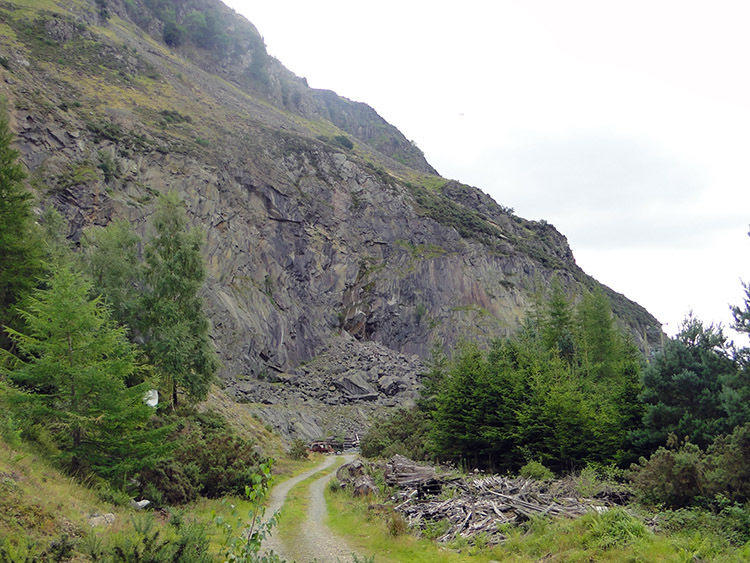 The high level path from Jim's Fold is an interesting route to the easier ground below the crags. 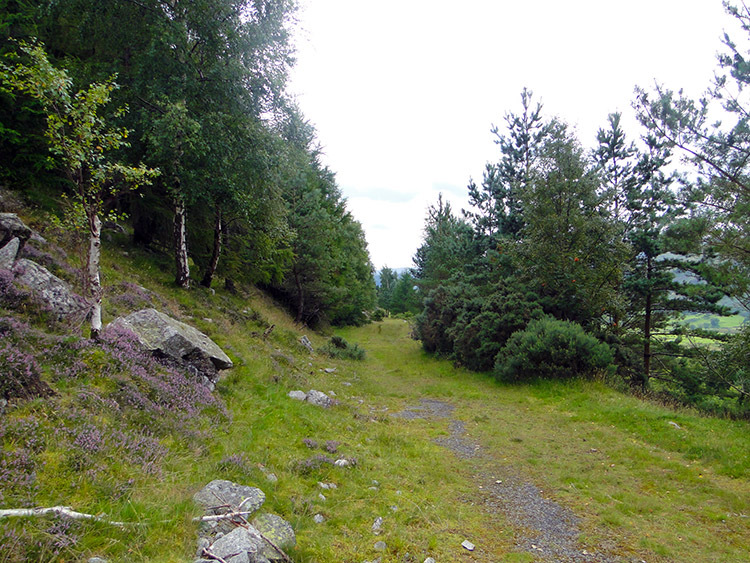 Easiest of all is the grass slope to the old coach road at Hause Well. In bad weather conditions Clough Head is a dangerous place. All steep ground should be avoided and the descent made down the easy grass slope north-north-east to the old coach road. A descent by Fisher Wife's Rake should not be contemplated and the natural funnel of Sandbed Gill should be strictly left alone" So instead of following Fisher's Wife Rake we took the safe option and descended Clough Head by it's eastern aspect to White Pike from where we turned north to track to the Old Coach Road with the fabulous sight of Blencathra directly in our eye line. The next 2.5 kilometres walking on the Old Coach Road were of an easy descent to Birkett Bank, an area of disused quarries. We left the open fells at Birkett Bank and followed an old quarry track past the series of abandoned quarries, Hilltop Quarries being the first. As we travelled on the old quarry road we came across more abandoned sites which prompted Steve to ask the question "When do the quarrymen decide when one quarry is spent and another one started" We were all stuck for an answer but it was true to note that there were a number of them all in similar state of abandon as we made our way along the track towards the high side of Lowthwaite Farm. On our passage through the site of the disused quarries we came across lots of abandoned equipment too including all the materials required to assemble a railed track along its length. Rusted vehicles were prolific too, enough to make a Scrap Dealers Christmas. 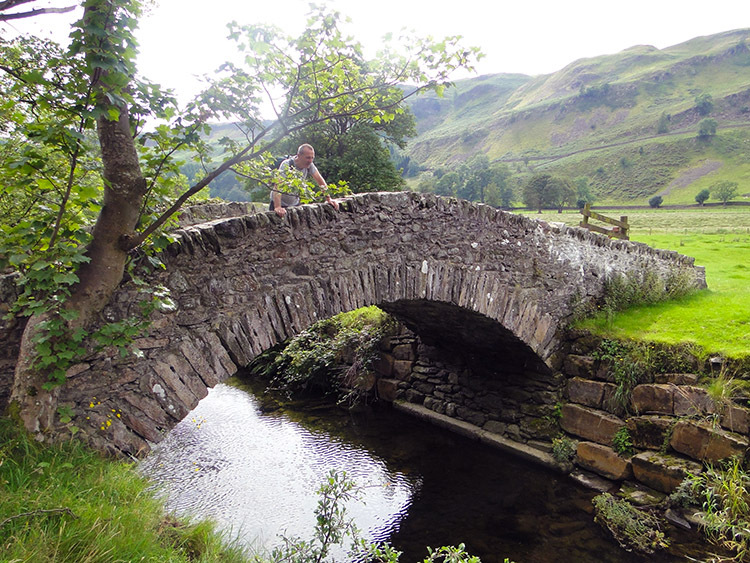 After the collection of old quarries and debris we reached the B5322 road and followed it south for 400 metres until we crossed a packhorse bridge near Bramm Crag which took us to the west side of St John's Beck. From here we followed the beck south to Sosgill Bridge and then Low Bridge End arm where we had a very comical encounter with a curious turkey. It was a new one on us all as the turkey acted more like a pet and began following us as we walked through the farm grounds. Throughout the journey from the packhorse bridge I had also been draw to the impressive face of Castle Rock on the face of Watsons Dodd and to Wren Crag which were walking towards. As wee neared the eastern edge of Wren Crag the path forced us up from the beck side to 20-30 metres higher. 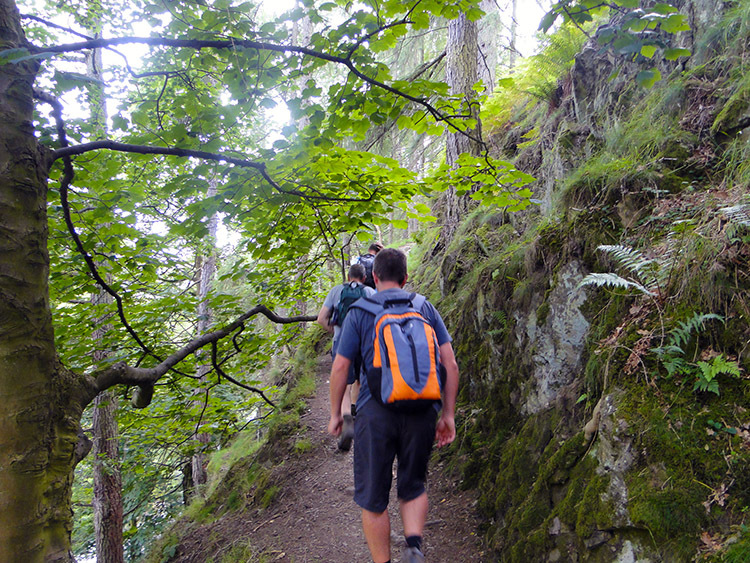 It was a superb path with a sheer rock face to our right and a sharp drop through trees to the beck to our left. Not a section to lose grip and fall down but a wonderful passage and a final high before we emerged out of the woodland to the roadside of the busy A591 Ambleside to Keswick road which we had to follow on a decent verge for 600 metres until we finally crossed the B5322 at Legburthwaite. Despite the final 600m trudge on the road we were well satisfied on a fantastic days walking of just over ten miles which featured a steep climbing start, a bound over rolling grassy fells, a meeting with paragliders, sublime views of the mountains - particularly Blencathra and Skiddaw, a detoured descent from the tops, a history walk through disused quarries and old equipment, a beck side stroll, a mad turkey and a great woodland ending. Brilliant.